WITH the unveiled sight of the glorified Redeemer, will be associated the certain reunion and perfected communion of all the glorified saints. We are far from placing this feature of glory in an obscure distance of our picture of heavenly happiness. A source of so much pure and hallowed enjoyment now, surely will not be wanting nor be more limited hereafter. It is a high enjoyment of earth, that of sanctified relationships and sacred friendships. The communion of renewed intellect, the union of genial minds, and the fellowship of loving and sympathizing hearts, God sometimes kindly vouchsafes, to smooth and brighten our rough and darksome path to the grave. But death interposes and sunders these precious ties. And are they sundered forever? Oh, no! We shall meet again all from whom in faith and hope we parted—whom we loved in Jesus, and who in Jesus have fallen asleep. “For we believe that through the grace of our Lord Jesus Christ we shall be saved even as they.” Heart-breaking as was the separation, it was not final, nor will it be long. The time-piece we wear upon our people reminds us at each second, that the period of our reunion is nearing. Yes! we shall meet them again, in closer and purer friendship. They wait and watch for our coming. Do not think that they forget us: that cannot be; and thinking of us, they love us still. The affection they cherished for us here death did not chill; they bore that affection with them from the earthly to the heavenly home; and now, purified and expanded, it glows with an intensity unknown, unfelt before. Heavenly thought is immortal. Holy love never dies. Meeting, we shall know them again; and knowing, we shall rush into their warm embrace, and sever from them—never! “I would not have you to be ignorant, brethren, concerning those who are asleep, that you sorrow not, even as others which have no hope. For if ace believe that Jesus died and rose again, even so them also which sleep in Jesus will God bring with him.” What a soothing, sanctifying thought—what a heaven-attracting hope is this! 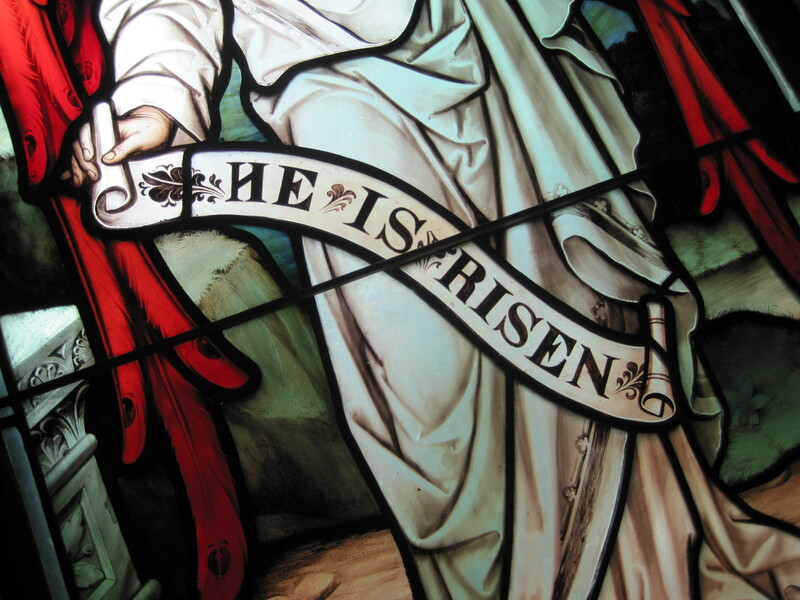 The resurrection of Christ is the pledge and earnest of the glorious resurrection of the believer. This great event—the crowning bliss of the church—has long been as a star of hope, on which the eye of faith has loved to gaze. THE resurrection of Christ is a vital doctrine of Christianity. It sustains an essential relation to the spiritual life of the believer. Viewing it in connection with the union of Christ and His people, the two facts become identical—standing in the relation of cause and effect. Our Lord, in His great atoning work, acted in a public or representative character. He represented in His person the whole elect of God, who virtually were in Him, each step that he took in working out their redemption. In His resurrection from the grave this was preeminently so. The Head could not be resuscitated apart from the body. Christ could not rise without the Church. Thus, then, the new or the resurrection life of Christ, and the inner or spiritual life of the believer, are one and indivisible. Now, when the resurrection of the Head is spiritually realized, when it is fully received into the heart by faith, it becomes a quickening, energizing, sanctifying truth to each member of His body. It transmits a power to the inmost soul, felt in all the actings and manifestations of the spiritual life. Blessed are they who feel, and who feel daily, that they are indeed “risen with Christ,” and who find every new perception of this great truth to act like a mighty lever to their souls—lifting them above this “present evil world”—a world passing away. Perhaps no circumstance connected with the resurrection of Christ conveys to the mind a clearer idea of its bearings upon the happiness of the Church than the part which the Divine Father is represented as having taken in the illustrious event. His having committed Himself to the fact at once stamps it with all its saving interest. “Whom God has raised.” “Like as Christ was raised up from the dead by the glory of the Father.” “If the Spirit of Him that raised up Jesus from the dead.” By this act of raising up His Son from the grave, the Father manifested His delight in, and His full acceptance of, the sacrifice of Christ, as a finished and satisfactory expiation for the sins of His people. So long as Jesus remained in the grave, there was wanting the evidence of the acceptance of His death; the great seal of heaven, the signature of God, was needed to authenticate the fact. What are some of the great truths confirmed by the resurrection of Jesus, and in the belief of which the believer is built up, by this glorious and life-inspiring doctrine? They are many and vast. Indeed, it would not be too much to affirm of the entire system of Divine truth, that it depended mainly for its evidence upon the single fact of Christ’s resurrection from the dead. In the first place, it establishes the Bible to be the revelation of God. If the types which shadowed forth, and the prophecies which predicted, the resurrection of the Lord, received not their substance and their fulfillment in the accomplishment of that fact, then the Scriptures were not true, the types were meaningless, and the predictions were false. For thus do they unite in setting forth this glorious and precious truth. First, as it regards the types. What was the receiving back of Isaac after he had been laid upon the altar, and the knife raised to slay him, but the shadowing forth of Christ’s resurrection? As the binding of him upon the wood prefigured the sacrificial death of Christ, so the unbinding of him from altar, and his surrender to his father the third day from the time that he received the command to sacrifice him, prefigured the risen life of Christ. Significant type! radiant with the glory of a Jesus! In the one part we see Him dying, the other part we see Him rising. The one shadows forth His atoning sacrifice, the other His risen glory. The prophetic Scriptures are equally as explicit in setting forth the resurrection of Christ. “My flesh also shall rest in hope. For You will not leave my soul in hell, neither will You suffer Your Holy One to see corruption.” “You are my Son, this day have I begotten You.” “I will make an everlasting covenant with you, even the sure mercies of David.” Now mark how these portions of the prophetic Scriptures are quoted by the apostle Paul, and strictly applied by him to the resurrection of Christ. Acts 13: “But God raised Him from the dead: and He was seen many days of those who came up with Him from Galilee to Jerusalem, who are His witnesses unto the people. And we declare unto you glad tidings, how that the promise which was made unto the fathers, God has fulfilled the same unto us, their children, in that He raised up Jesus again; as it is also written in the second Psalm, You are my Son, this day have I begotten you. And as concerning that He raised Him up from the dead, now no more to return to corruption, He said this wise, I will give you the sure mercies of David. Why He says also in another Psalm, You shall not suffer Your Holy One to see corruption. For David, after he had served his own generation by the will of God, fell on sleep, was laid unto his fathers, and saw corruption; but He, whom God raised again, saw no corruption.” How brightly does the doctrine of a risen Savior shine throughout this remarkable portion of God’s holy word! Truly the life of Jesus is the life of the Scriptures. The hope to which the resurrection of the Lord has begotten the believer is termed by the apostle a “lively,” or, as it may be rendered, a “living hope.” Its life springs from the resurrection-life of Christ, just as the same glorious event imparts quickening to the whole Christian economy. “Blessed be the God and Father of our Lord Jesus Christ, which, according to His abundant mercy, has begotten us again unto a lively hope, by the resurrection of Jesus Christ from the dead.” Thus the believer, and he alone, can adopt the language of his Lord, as he resigns his body to the dust—and oh! Observe how closely the two events—the resurrection of Jesus, and that of the believer—are interwoven one with the other. “Now is Christ risen from the dead, and become the first-fruits of those who slept.” “Every man in his own order: Christ the first-fruits; afterwards they that are Christ’s at His coming.” What was the meaning of the first sheaf, which, under the law, was commanded to be presented before the Lord in His temple? Was it not to be considered as an earnest, a pledge, and a pattern of the future harvest, ripening for the sickle? So was the resurrection of Jesus Christ from the dead. Of the downward tendency of our hearts we are, alas! but too conscious. We need an antagonistic principle- something to counteract the overworking influence of an ungodly world. Where shall we meet with it? We answer, in the power of Christ’s resurrection, felt, realized, and experienced in the soul. This is the argument of Paul: “You are a risen people, risen in union with Christ. If this be so, then seek after heavenly mindedness, setting your affections on things above.” What a heaven-attracting power, then, has this glorious truth! What is Christ? He is alive. Where is Christ? He is in heaven, at the right hand of God, as my head- my representative- my forerunner- my treasure- my all. Then, let me rise! Shall not my affections soar to their best beloved? Shall not my heart be where its treasure is? Shall I set my mind upon things on the earth, when my Lord rose out of the earth, and ascended above the earth, and bids me rise and follow Him in faith, in spirit, and in love, until He calls me to come away to Him entirely, that I may be ever with Him and behold His glory? If I am indeed risen with Christ, then let me evidence it by my increasing spiritual-mindedness. Christ, who is my life, is in heaven- why should I needlessly be buried in the earth? Why allow- as I appear to do- that there is an object upon earth whose claims to my love are paramount, whose beauty to my eye is greater, whose attraction to my soul is stronger, than my risen, ascended, and glorified Lord? Is there upon earth one who loves me as Jesus loves me? Is there one who has done for me what Jesus has done? Is there one who is doing for me now what Jesus is doing? Is there one who is to me such a friend, such a brother, such a counselor as Jesus? No, not one! Then, why should not my thoughts be more with Him? Why should not my heart cling closer to Him? Why this vagrancy of mind, this truancy of affection, this wandering of desire; why this forgetfulness, coldness, and cleaving to earth, when my Lord is risen, and I am professedly risen with Him? Oh, to feel more sensibly, more deeply; more constantly the power of His resurrection! Lord! I detect my heart settling down on creature things- objects of sense and sin. My business is a snare- my domestic blessings are a snare- my friendships are a snare- my position is a snare- the too fond opinion which others entertain of me is a snare- my grace, my gifts, my usefulness, through the corruption of my heart, are snares. Lord, place beneath my soul the mighty lever of Your resurrection, and lift me towards Yourself! Oh, let me feel the earth-severing, the heaven-attracting power of Your resurrection-life! Having been buried with You by baptism into death, sincerely would I now rise with You, like as You were raised up from the dead by the glory of the Father; that I might walk with You in newness of life, until I reach You in the realms of glory. How beautifully the apostle associates the two blessings! He is now truly the “God of peace” – the pacified God, the reconciled Father; and the evidence of it is His raising up His dear Son from the grave. Thus what a bright view does this truth unfold to us of God! When we retire within ourselves, we see much to engender dark views of, and distrustful feelings towards, Him. But when faith travels to the grave of Jesus, and we see it empty, we have such an overwhelming evidence of the perfect reconciliation of God, of His thoughts of peace towards us, that instantly faith triumphs, and all our gloomy, trembling apprehensions of His character vanish and disappear. He is the “God of peace,” because Jesus is a risen Savior. And in proportion as you lay hold by faith of the resurrection-life of Christ, you will have that pillar to sustain you upon which rests the whole fabric of salvation. The peace of God will fill your heart, as you know from experience the power of the Lord’s resurrection in your soul. The power of Christ’s resurrection, in fact, lies in a sense of pardoned sin, in our apprehension of complete justification, in the living hope of eternal glory. Jesus saves to the uttermost all that come unto God by Him, because he is a risen and a living Savior, and ever lives to make intercession in behalf of all His people. Oh, deal believingly with a risen Christ! The same resurrection-power which brought back to life again the Head of the Church is exerted in effecting the spiritual resurrection of the Church itself. The true believer is already risen. He was once dead in sin, and entombed in the grave of his iniquities. But a power- the same which awoke the death-slumber of Lazarus- has darted from the tomb of Jesus, and has quickened Him to a new and a deathless life. Oh, were we more directly to trace the mighty energy of the Eternal Spirit in our souls, raising us from the region of death to life and immortality, to that stupendous fact of redemption- the resurrection of Christ from the dead- how would it exalt our views of its importance, and fill our souls with its glory! What must be the power of our Lord’s resurrection, that can even now awake the profoundest sleep of spiritual death! When the Spirit of God puts forth His own grace to raise a soul from the grave of sin, oh, forget not it is in virtue of a risen, living Savior. Let the Christian invalid be cheered with the prospect of before long arriving at this land of light and love, of rest and holiness. The moment the spirit is “absent from the body, and present with, the Lord,” it treads those balmy shores, where health breathes in the air, flows in the waters, and sparkles in the sunbeams. There is no sickness in heaven, for “the people that dwell therein shall be forgiven their iniquity;” and this accounts for the absence of all physical malady. Christian sufferer! you are nearing this land- a few more days of languishing and pain, a few more nights of weary wakefulness, and you are there! Don’t you see, through the chinks of the “earthly house of this tabernacle,” “a building of God, a house not made with hands, eternal in the heavens”? Don’t you see the “city which has foundations, whose maker and builder is God”? It has “no need of the sun, neither of the moon, to shine on it: for the glory of God does enlighten it, and the Lamb is the light thereof. . . The gates of it shall not be shut at all by day: for there is no night there.” Soon you will exchange this hospital for your Father’s house, and as you cross the threshold, the last pang is inflicted, the last sigh is heaved, and the last tear is brushed from your eye. Let the Christian reader fully believe this one truth- that Jesus is alive again, and it will afford to his soul greater confirmation of the veracity of God’s character, of the truth of His word, and of the perfection and all-sufficiency of Christ’s work, than all other truths beside. Is Jesus alive at the right hand of God?- then the debt is paid, and justice is satisfied. Is Jesus alive at the right hand of God?- then the Father is well pleased in the work of His Son, and He “rests in His love, and rejoices over His Church with singing.” Is Jesus alive?- then every promise shall be fulfilled, and all the blessings of the everlasting covenant shall be freely bestowed, and I, a poor worthless sinner, yet resting upon His atoning work, shall live also. May the Holy Spirit lead you into the full belief- the belief of the heart as of the judgment- of this glorious truth. It is the keystone of the temple; press it as you will, the more you lean upon it, the stronger you will find it- the more you rest upon it, the firmer will grow your hope. Only receive it in simple faith; Jesus is alive- alive for you- all you need in this valley of tears is here; all your temporal mercies are secured to you here; all your spiritual blessings are laid up for you here.